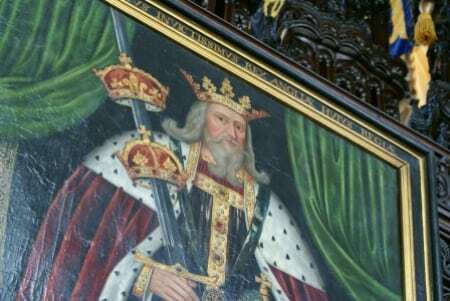 2012 marks the 700thanniversary of the birth of King Edward III. He was born on 13 November 1312 in Windsor Castle and baptised three days later. As the founder of both the Order of the Garter and the College of St George, the anniversary is being marked at St George’s Chapel in a number of ways. 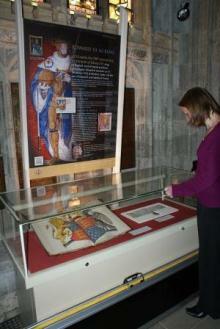 Visitors to the Chapel are able to see a number of items linked to the King in the South Quire Aisle. A temporary exhibition (in place until the end of the year) showcases fascinating items from the Archives and Chapter Library. Opening hours are Monday to Saturday 10am to 4pm; Castle Admission charges apply. 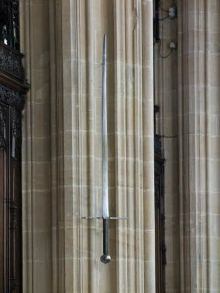 In the same aisle hangs Edward III’s sword; it is well over 6ft in length and hangs beside a picture of the King shown with the crowns of England, Scotland and France. At the east end of the South Quire Aisle is another reminder of the King’s link with St George’s. A roof boss depicts the King’s great grandson, Edward IV (the builder of the current Chapel), kneeling beside a depiction of the Cross Gneth or Croes Naid. It is told that a piece of the true Cross was brought back from the Holy Land by a Priest called Neotus and taken to Wales. The relic remained in Wales until King Edward I took it in 1283 after the death in battle of Llewellyn, the last Prince of Wales of the native line. King Edward II kept the relic at the Tower of London but his son, King Edward III, gave it to the Chapel at Windsor soon after he had founded the Order of the Garter and the College of St George. The relic disappeared in the 16th century but the boss serves as a permanent reminder of its history. Two Windsor Festival talks at the end of September focussed on King Edward III. They included looking at what buildings within the Castle walls remain from the time of King Edward III. One of the new set of buildings was the Canons’ Cloister which lies to the north east of the current Chapel. It was built in the 14th century to house the Priests of the newly founded College of St George whose statutory duty was, and is, to pray for the Sovereign and the Knights of the Garter. For the last two years the Cloister has been refurbished with a new lead roof, new wiring, fire protection, wall painting conservation, masonry repairs and carpentry repairs. Before and during the work detailed archaeological records were taken and new discoveries made about the Cloister. This will all be discussed at a (fully booked) one day seminar in early October. Evensong at St George’s Chapel on 13 November will mark the anniversary of King Edward III’s birth. You are welcome to attend the Service, which starts at 5.15pm. It is open to all as are the three or four Services held every day in the Chapel.